Along the coastline of St Juliens on the Great Northern Peninsula in Newfoundland, Canada, homes sit upon the hillside and fishing stages line the banks of the harbour. Just outside the entrance to St. Julien's harbour, scattered pieces of pack ice sit upon the surface of the ocean as they continue on their journey melting as they go. Homes and Fishing Stages along the waterfront of St Julien's with pack ice beyond the entrance to the harbour, St Julien's, French Shore, Viking Trail, Northern Peninsula, Great Northern Peninsula, Newfoundland, Canada. 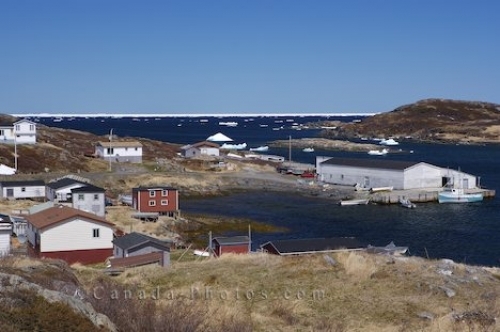 Picture of the harbour of St Juliens, Newfoundland and the open ocean filled with pack ice that passes by this town.